I really didn’t expect this series of posts to reach part four! But a couple of weeks ago I was down in Pembrokeshire and took an early morning walk from the car park at Whitesands towards St. David’s Head. An active cold front had pushed through overnight and as well as bringing heavy rain, it formed the leading edge of an arctic airmass which eventually covered the whole of the UK. The air was sparkling in its clarity and the temperature several degrees Celsius lower than it had been the previous day; very invigorating and ideal for the outdoor photographer! After a landscape session at Porth Melgan and a frustrating hunt for migrant birds on St David’s Head, I returned to the van. I noticed there was a flock of choughs, rooks and jackdaws feeding in a nearby field. There was a pattern to their behaviour; they would start at one end of the field and work their way into the wind, feeding as they went, until they reached the hedge-bank. Then they flew back to the shoreline for a few minutes before returning to the field. I wondered if I could get myself into position at the end of the field while they were away and photograph them as they came towards me. So I donned the nearest I had to camouflage gear and headed over. Corvids are the most intelligent of birds and they noticed me immediately. 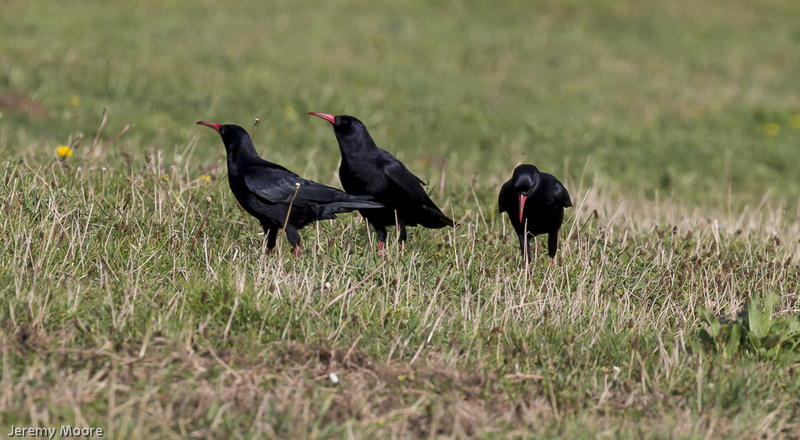 But they were not entirely spooked; the chough, in particular, stayed faithful to the field and I felt sure that, eventually, they would come close enough to be photographed. As the afternoon wore on and my body became more numb it became apparent that they were no longer so hungry and that feeding time was more or less over. So eventually never really came and I tried to be philosophical as I returned to the van. It was worth the try….wasn’t it? Just a couple of days ago I had a look at the results from the session. In an ideal world the birds would have been closer, but to my surprise a couple of images were actually quite useable. Thanks to the quality of my equipment – Canon 5d3 and Tamron 150-600 zoom – and the excellent light, I was able to crop down quite deeply into the image without encountering sharpness or noise problems. The image above begins to illustrate how full of character choughs really are. This entry was posted in Uncategorized and tagged bird photography, chough, choughs, fieldcraft, outdoor photography, whitesands. Bookmark the permalink.